Go the extra mile and make scones from scratch. 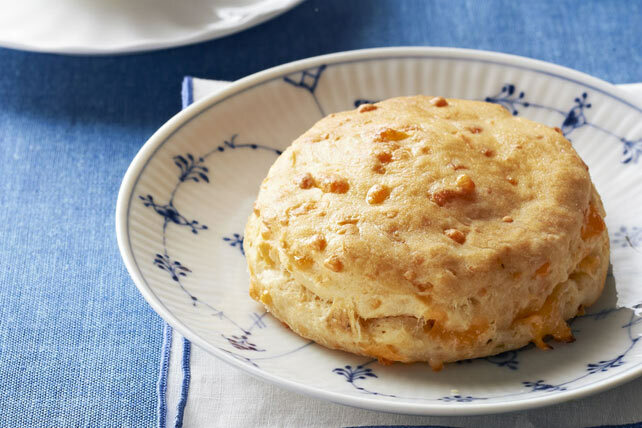 These Cheese Scones are almost as easy to make and you can taste the difference in just one bite. Mix first 4 ingredients in large bowl. Cut in butter with pastry blender or 2 knives until mixture resembles coarse crumbs. Stir in cheeses. Whisk eggs and milk until blended. Make well in center of flour mixture. Add egg mixture; stir with fork until mixture forms stiff dough. Lightly knead dough just until it holds together. Pat or roll out to 1/2-inch thickness; cut into 3-inch rounds with floured biscuit cutter, rerolling scraps as necessary to make 10 rounds. Place on parchment-covered baking sheet. Bake 15 to 17 min. or until golden brown. Serve warm. The cold butter helps to make the scones both tender and flakey. Also, it's important to knead the dough just until it holds together to help prevent the baked scones from having a dense texture.